"My dream is to end suffering in my community and the world and achieve gender equality. 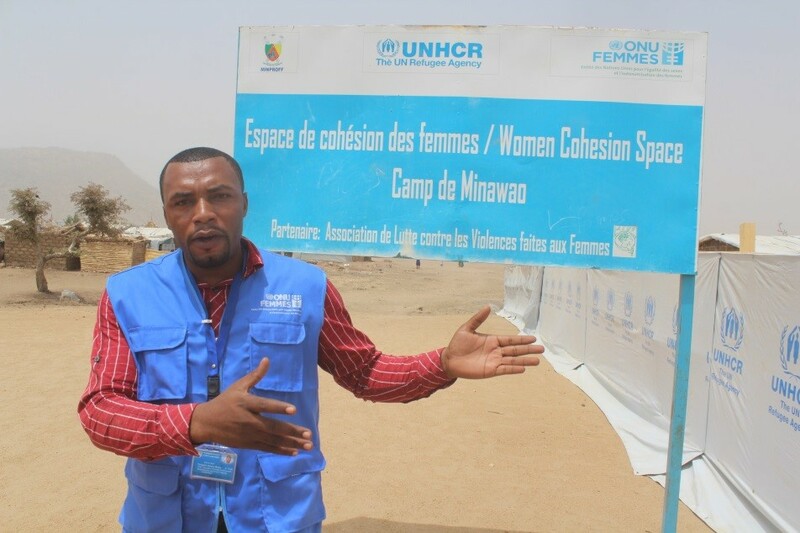 To see a world where every human right is respected by all and for women to be seen as partners, not as objects" says Jimmy Henry Nyingcho, a national UN Volunteer with UN Women at the Minawao refugee camp in Maroua, Cameroon. Maroua, Cameroon: Jimmy Henry Nyingcho, 31 years old, is a national UN Volunteer, married and a father of one. He is assigned with UN Women Cameroon as the gender, women empowerment and social cohesion expert, and he is helping women refugees gain skills to generate income. These women are based at the Minawao refugee camp in Maroua, that hosts close to 60,000 refugees from Nigeria. "I joined the UNV programme in January 2014 to also assist in offering protection to the poor, defend human rights of others and save lives thereby promoting community development. I was willing to volunteer with UN Women because I wanted to play an integral part in advocating for gender equality, fighting to end violence against women and promoting women’s empowerment in my country. This, in my view, is the way to open new doors for sustainable development”. Jimmy explained "I feel very comfortable to work with women refugees because my life and career have been driven by a strong passion to alleviate the suffering of disadvantaged people around the world". Since January 2014, Jimmy has provided integrated assistance for economic rehabilitation to vulnerable refugee women and enhanced the refugee women’s leadership capacities in conflict prevention and conflict resolution. On a daily basis, he also moves between the two Social Cohesion Spaces at the Minawoa refugee camp set up by UN Women and the host communities of refugees to provide direct assistance to victims of gender-based violence and vulnerable women and help them undertake activities that will lead to rapid income generation. "I have trained 1,000 community leaders on mediation and negotiation skills in preventing and resolving conflicts. Apart from refugees, I have equally provided the same assistance to 18,000 Internally Displaced persons (IDPs) in the Far North Region of Cameroon," says Jimmy.